Since the 15th century, artists all over the world have been using oil paints to transfer their creativity onto canvas with high colour brilliance in a long-lasting way. Our KunstLoft artists have adopted the “classic supreme discipline” of painting for themselves and create oil paintings in an impressive large-format size. The use of this particular paint material enables them to apply the wet-on-wet painting technique in a wonderful way, resulting in flowing colour gradients that are characteristic of abstract style motifs. Another special feature can be observed in the hardening process: The colour spectrum expands and gives every XXL canvas oil painting a unique refinement. Decorate your doctor’s office with hand painted artworks that cannot be found or duplicated anywhere else. come to life in the complexion-toned colour. Artists at KunstLoft paint oil paintings predominantly in large format. Extravagantly-sized canvases offer adequate space to translate motifs with an elevated attention to detail. Emphasise the romantic ambience in your bedroom with a handmade painting of hearts — the universal symbol of everlasting love and deep bonds. If you prefer a more subtle motif that nonetheless conveys a strong message, an XXL oil painting with roses is the right choice for you. The flowers stand for passion, deep feelings and perfect beauty. Spruce up your living room with exclusive artworks featuring meaningful motifs. Painting with high quality oil paint is the ultimate artistic discipline. You can enjoy oil paintings on canvas for a long time because the durable paint has a high opacity and is characterised by uniquely vivid colours. 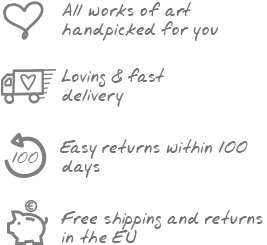 You can find impressively large handmade canvas paintings at KunstLoft.